1. A soccer match which began at 1800 hours GMT at town B on longitude 900W was telecasted live to an audience in town T on longitude 150E. The local times in towns B and T were respectively __. 2. Vacation in the length of day and night over the Earth’s Surface are due to the ___. 3. Which of the following lines of latitude divides the Earth into two hemispheres? 4. The equatorial circumference of the Earth is ____. 5. On which of the following pairs of dates is the length of day and night equal on the Earth’s Surface? 6. A mercury barometer is used for measuring ____. 7. Which of the following pairs are desert landform? 8. A period of 24 hours of rain with amount got not below 0.2 mm is called ___. 9. Rocks which have been formed as a result of cooling and solidification of molten magma are called ___. 10. The major terrestrial ecosystem are often referred to as ____. 11. Land satellite collects data by using ___. 12. Nigeria’s second sea port in terms of tonnage of goods handled is ___. 13. Which of the following Geo-political Zones has the highest population density in Nigeria? 14. The highest land in Nigeria is found on the __. 15. Which of the following gives the best description of Lagos? 16. A river loses energy and may deposit some of its load if __. 17. Which of the following is “NOT” a resource of the atmosphere? 18. One of the following is not associated with glaciated highland? 19. A linear settlement is most likely to develop a ___. 20. All of the following can be found in the upper course of a river except ___. 21. Overland flow is ___. 22. Which is a group of stars, gas and dust held together by gravity? 23. Which of the following is wrongly paired? 24. The main characteristic of a river entering the sea is ___. 25. In a forested region, one human activity likely to be embarked on is ___. 26. An example of a landform produced by glaciations is ___. 27. The following Lakes formed by deposition except ___. 28. Temperature decreases with height at a rate of about ___. 29. Under which of the following climates would you except physical weathering to be normally? 30. Water bodies cover about ___. 32. The circulation of the oceans and the atmosphere primarily help to re-distribute and equalize global ___. 33. The appearance of a features on a map is a function of ___. 34. A common natural response of people of the problem of uneven distributed of resources in a place is ___. 36. The critical temperature at which the air being cooled becomes saturated with vapour is known as __. 37. With which one of the following areas are active volcanoes associated? 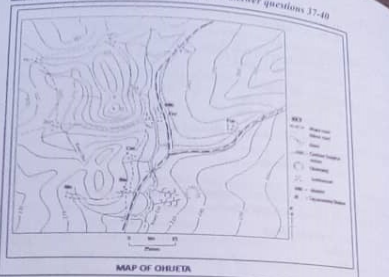 Instructions: Use the map below to answer questions 37-40. 37. The bearing of Fan from Ere is apparently ___. 38. The likely occupation of the people in the area is ___. 39. River Dor flows towards the ___. 40. Fan Settlement can be described as ___.